The German rearmament (Aufrüstung, German pronunciation: [ˈaʊ̯fˌʀʏstʊŋ]) was an era of rearmament in Germany during the interwar period (1918-1939), in violation of the Treaty of Versailles. It began as soon as the treaty was signed, on a small, secret, and informal basis, but it was massively expanded after the Nazi Party came to power in 1933. Despite its scale, the Aufrüstung was for years a largely covert operation, carried out mostly in a cloak-and-dagger manner through organizations (some of which were racketeer-style fronts), until the reality of the German rearmament was exposed by Carl von Ossietzky in 1931. Although his disclosures won him the 1935 Nobel Peace Prize, Carl von Ossietzky was condemned by the Nazi authorities to 227 days in jail —plus further imprisonment and torture until his death on 4 May 1938. Von Ossietzky's disclosures also triggered the Re-armament policy in the United Kingdom, which escalated after Adolf Hitler withdrew Germany from the League of Nations and the Geneva Disarmament Conference in 1933. The re-armament program quickly increased the size of the German officer corps, and organizing the growing army would be their primary task until the outbreak of World War II in September 1939. Count Johann von Kielmansegg (1906-2006) later said that the very involved process of outfitting 36 divisions kept him and his colleagues from reflecting on larger issues. Germany's post–World War I rearmament began at the time of the Weimar Republic, when the Chancellor of Germany Hermann Müller, who belonged to the Social Democratic Party (SPD), passed cabinet laws that allowed secret and illegal rearmament efforts. During its early years (1918-1933), the rearmament was relatively small, secret, and supported by a cross-section of Germans motivated by a mixture of patriotism-based nationalism and economics-based nationalism. The latter motive viewed the Treaty of Versailles, which was ostensibly about war reparations and peace enforcement, as being in reality an economic anticompetitive measure by which the British Empire and French colonial empire removed the German Empire from future global economic competition by effectively disbanding it. The World War I reparations would be difficult or impossible to pay without viable export markets for Germany's industrial sector, which was even larger than Britain's. The rearmers' hope was that Germany would slowly and quietly build up sufficient military potency until a time when it would return to colonial economic activity (or effectively similar activity of a neocolonial nature, although that name had not yet been coined for it), but Britain and France would decline to fight another war to enforce the Versailles Treaty, thus bringing the treaty's effects to an end. An example of the Weimar clandestine rearmament measures was the training and equipping of police forces in a way that made them not just paramilitary in organizational culture (which most police forces are, to one degree or another) but also well prepared to rapidly augment the military as military reserve forces, which the treaty did not allow. Another example was that the government tolerated that various Weimar paramilitary groups armed themselves to a dangerous degree. Their force grew enough to potentially threaten the state, but this was tolerated because the state hoped to use such militias as military reserve forces with which to rearm the Reichswehr in the future. Thus various Freikorps, the Stahlhelm, the Reichsbanner, the Nazi SA, the Nazi SS, and the Ruhr Red Army grew from street gangs into private armies. One of the reasons why this militarization of society was difficult to prevent relates to the distinction between the government (meaning the executive) and the state. The democratically elected government, being composed of groups of people, inevitably reflected the factional strife and cultural militarism among the populace. But the German Revolution of 1918–19 had not truly settled what the nature of the German state ought to be; in a way parallel to how the Russian Revolution (1917) was followed by the Russian Civil War (1917-1922), Germany after its revolution was not very far from civil war—the different factions all hoped to transform the German state into the one that they thought it should be (which would require violent suppression of the other factions), and they expected their private armies to merge into the state's army (the Reichswehr) if they could manage to come to power. During the Republic's era of democracy, they all participated in the democratic definition of coming to power (winning votes), but many of them, on all sides, planned to abolish or diminish democracy in the future, if they could first get into position to do so. Some of the antidemocratic ideas aimed for zero democracy via totalitarianism (planned on the anticommunist side by Hitler and by the absolutist variants of the monarchists who wanted to restore the recently abolished German monarchy, and planned on the communist side by those opposed to democratic socialism). Others aimed for diminished democracy subordinated in power to other forces (planned on the anticommunist side by advocates of constitutional monarchy within the monarchist sphere, and planned on the communist side by those in favor of democratic socialism). Thus, for example, the Nazis expected their private armies (the SA and SS) not only to fight the communists at present but also to merge with the Reichswehr when the opportunity arrived, just as the Communist Party of Germany expected its private armies (the Ruhr Red Army and its equivalents in other regions) not only to fight the anticommunists at present but also to merge with the Reichswehr when the opportunity arrived. In fact, once that time came in 1933-34 (the Nazis having won out over the communists, first electorally and then in the subsequent power grab), there was a fight among the right-wing/nationalist/anticommunist factions about whether the Reichswehr would be absorbed or replaced by the SA (not the other way around); in other words, the SA was poised to transform from a private army into the state's army, deposing the former state army and absorbing its materiel and however much of its human resources could be tamed and converted. After the Nazi takeover of power in January 1933, the Nazis pursued a greatly enlarged and more aggressive version of rearmament. During its struggle for power, the National Socialist party (NSDAP) promised to recover Germany's lost national pride. It proposed military rearmament claiming that the Treaty of Versailles and the acquiescence of the Weimar Republic were an embarrassment for all Germans. The rearmament became the topmost priority of the German government. Hitler would then spearhead one of the greatest expansions of industrial production and civil improvement Germany had ever seen. Third Reich Interior Minister Wilhelm Frick, one of the most influential Nazi figures of the time, and Hjalmar Schacht, who (while never a member of the NSDAP) was an initially sympathetic economist, introduced a wide variety of schemes in order to tackle the effects that the Great Depression had on Germany, were the main key players of German rearmament policies (see Reichsbank#Nazi period. Dummy companies like MEFO were set up to finance the rearmament; MEFO obtained the large amount of money needed for the effort through the Mefo bills, a certain series of credit notes issued by the Government of Nazi Germany. Covert organizations like the Deutsche Verkehrsfliegerschule were established under a civilian guise in order to train pilots for the future Luftwaffe. Although available statistics don't include non-citizens or women, the massive Nazi re-armament policy almost led to full employment during the 1930s. The re-armament began a sudden change in fortune for many factories in Germany. Many industries were taken out of a deep crisis that had been induced by the Great Depression. By 1935, Hitler was open about rejecting the military restrictions set forth by the Treaty of Versailles. Rearmament was announced on 16 March as was the reintroduction of conscription. Some large industrial companies, which had until then specialized in certain traditional products began to diversify and introduce innovative ideas in their production pattern. Shipyards, for example, created branches that began to design and build aircraft. Thus the German re-armament provided an opportunity for advanced, and sometimes revolutionary, technological improvements, especially in the field of aeronautics. The Spanish Civil War 1936–1939 would provide an ideal testing ground for the proficiency of the new weapons produced by the German factories during the re-armament years. Many aeronautical bombing techniques (i.e. 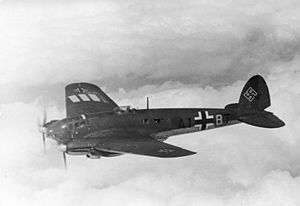 dive bombing) were tested by the Condor Legion German expeditionary forces against the Republican Government on Spanish soil with the permission of Generalísimo Francisco Franco. Hitler insisted, however, that his long-term designs were peaceful, a strategy labelled as "Blumenkrieg" (Flower War). Re-armament in the 1930s saw the development of different theories of how to prepare the German economy for total war. The first amongst these was 'defence in depth' which was put forward by Georg Thomas. He suggested that the German economy needed to achieve Autarky (or self-sufficiency) and one of the main proponents behind this was I.G. Farben. Hitler never put his full support behind Autarky and aimed for the development of 'defence in breadth' which espoused the development of the armed forces in all areas and was not concerned with preparing the German economy for war. ↑ Pool, James; Pool, Suzanne (1978), Who Financed Hitler: The Secret Funding of Hitler's Rise to Power, 1919-1933, Dial Press, ISBN 978-0708817568. ↑ "Watch German Re-Armament Video". Ovguide.com. Retrieved 27 August 2014. ↑ Hakim, Joy (1995). A History of Us: War, Peace and all that Jazz. New York: Oxford University Press. pp. 100–104. ISBN 0-19-509514-6. ↑ Fischer, Klaus (1995). Nazi Germany: A New History, p. 408. ↑ Evidenced in a January 1937 speech prior to the outcry over the bombing of the Basque city of Guernica, known by the Luftwaffe as Operation Rügen. Hitler speech to Reichstag 30 January 1937 available via the German Propaganda Archive.